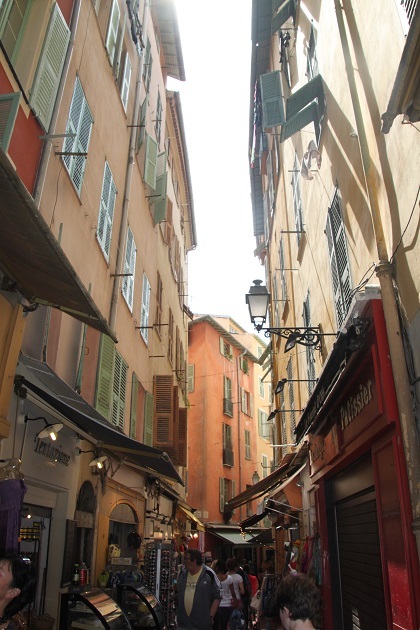 The Old Town area of Nice was my favourite part of the city – a maze of narrow streets, red tiled roofs and Italianate facades, it looks like it has hardly changed for centuries. Strolling around and soaking up the atmosphere in this part of the city is an absolute delight. 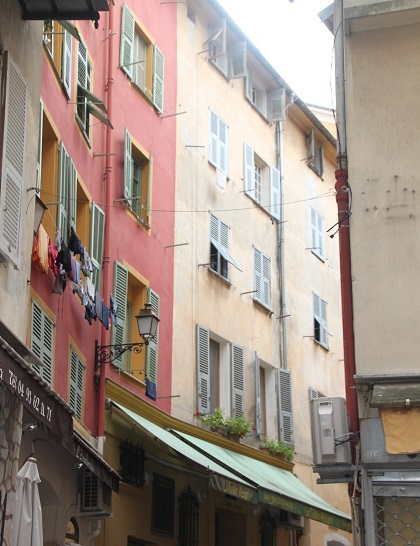 Laundry hangs from windows and flaps in the breeze, the buildings are packed in snug and tight and everywhere seemed to be selling food or Provencal souvenirs. The whole area was buzzing, a great atmosphere, we followed our noses, gazing into spice shops, smelling the wares and going where the fancy took us. 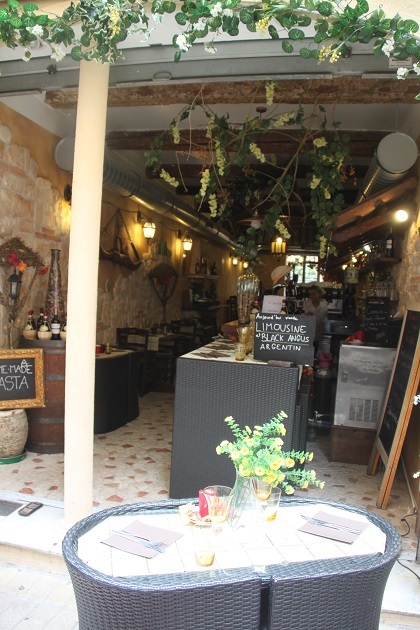 Eventually we found Fennochio’s – a place I did intend to visit. This is the most wonderful ice-cream stall selling world famous wares. The flavour range is vast – unlike anything I’d ever seen before. All the traditional offerings, some unusual flavours too and then the downright bizarre – beer ice cream, tomato ice cream and thyme ice cream I have to admit did not appeal to me too much. Son stuck to form with chocolate and gave it a thumbs up. 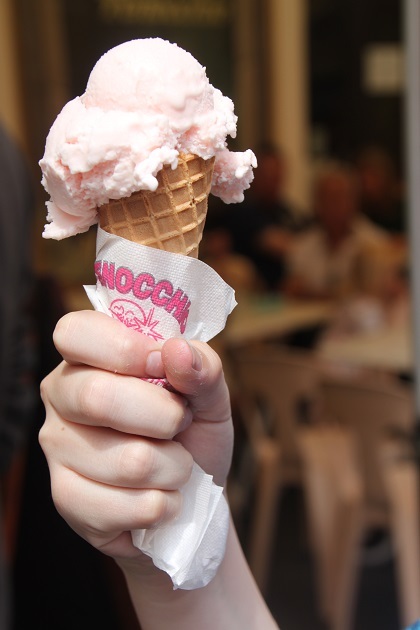 Husband chose lavender and violet and I opted for rose flavour – all were delicious. 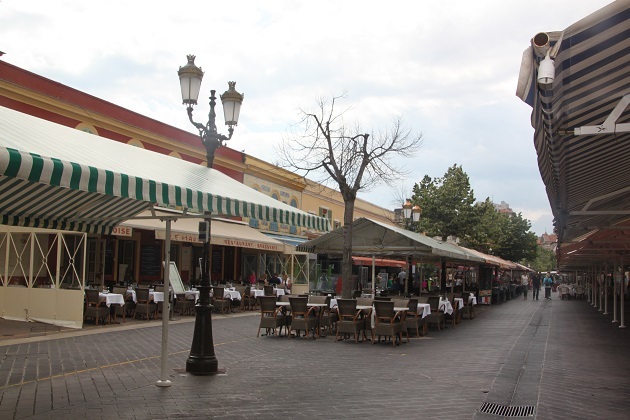 We arrived in the Cours Saleya too late for the fruit and vegetable market, instead they were setting up tables for the evening. 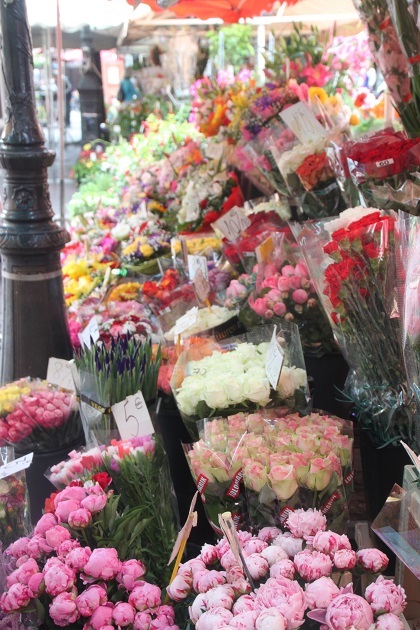 We did find the flower market though and ended our visit to the Old Town with an explosion of colour and aroma. 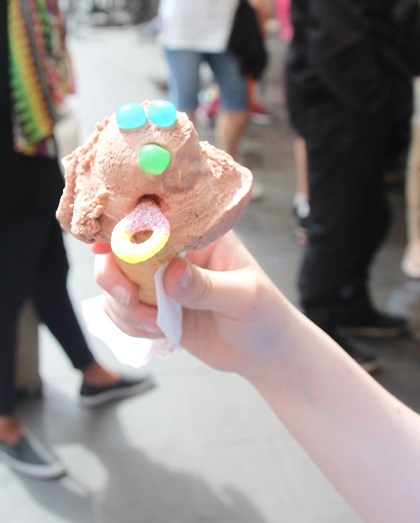 There are definitely some wacky ice cream flavours out there – I remember seeing “smoked salmon” once in Spain and wondering who on earth would choose that! Eeeh – smoked salmon and ice cream – I just can’t get that!! It was like that here too, rose was a plenty adventurous choice for me and it was delicious too!! I struggled to see who it could possibly be aimed at! 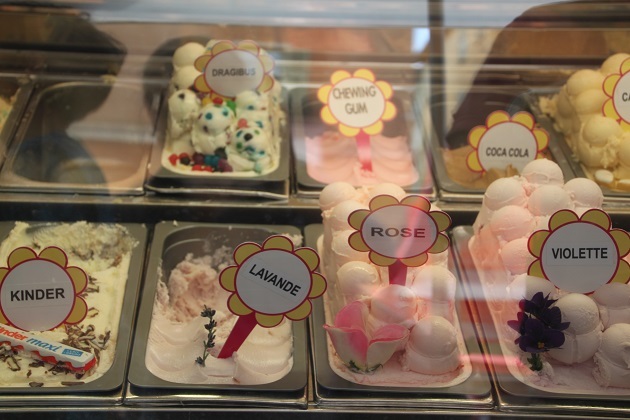 I’ve never tried floral-flavoured ice creams, I’ll have to give it a whirl someday! I like to try unusual flavours of ice cream but would draw the line at beer or tomato flavours – your selections sound much better. My current favourites are salted caramel, liquorice and coconut (but not together!). We ate at night in that flower market area and the atmosphere was nice. Whenever I see washing hanging from high I wonder how many socks fall off never to be seen again! Have a nice weekend! We lose enough socks in our house, can’t imagine how we’d keep track with our washing hanging out like that!! The flower market looked so lovely when they were setting up the tables, made me regret having to take the train back to Cannes, I would have loved to eat there. I think washing machines eat up socks, I always have a pile of odd socks on top of the dressing table that never seem to find their partners! That ice cream seems to take on the colour of the buildings? Good observation – never noticed before but you’re definitely right!! That looks to have been a treat for all the senses. It was – smells, noise and then that amazing ice cream, it was just such a great place. We were happy with the flavours we chose Suzanne, not too weird but I can’t imagine they sell a lot of tomato ice cream!! It is so pretty and quaint, perfect for wandering. Beautiful photos! When we were just down the coast in Cassis, my kids loved eating Violet ice cream. Unexpected and delicious! We tried violet jam in a little village, like you say unexpectedly delicious!! I became a big fan of the rose and violet flavours – rose chocolate is to die for. Beautiful photos, Joy but some really crazy ice cream flavors. I wonder if people eat that stuff or just try it once. I didn’t see too many takers for the beer or tomato ice cream George, maybe there are not too many crazy people around!! I thought rose flavour was daring enough for me – plus it was delicious!! Rose ice cream? Sounds interesting. I would probably have opted for a unique flavor too simply because I like experiencing new things. Nice sounds amazing! 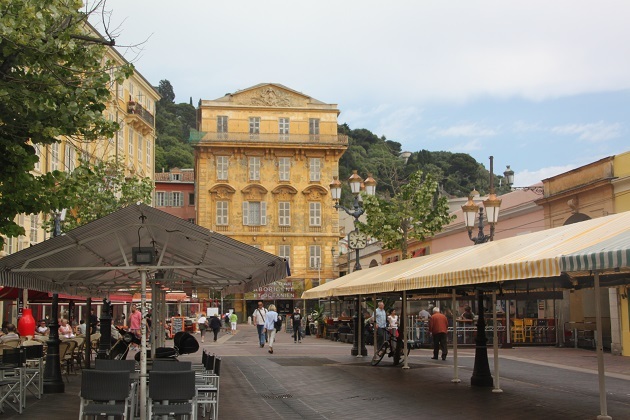 It is such a lovely part of Nice, full of atmosphere and gorgeous buildings and then that ice cream!! What a spectacular spot–so much charm! Your photos capture the look beautifully! Thanks Kerry, it is such a gorgeous place and full of atmosphere, a beautiful and memorable wander! 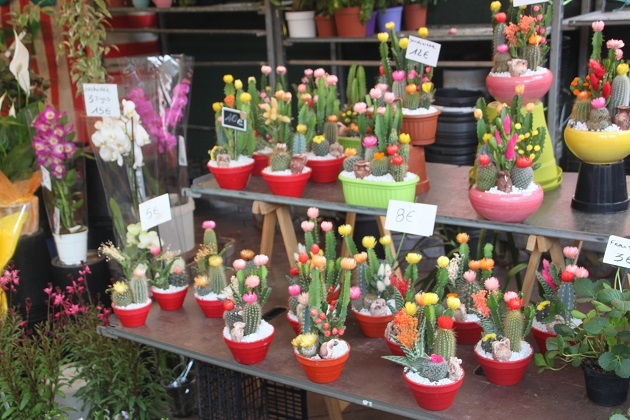 The flower market was superb Pam – as was the ice cream!! Hope your weekend is a wonderful one too. Your photos are so charming! I love rose ice cream. I had it once at Butchart Gardens in Victoria, Canada, and it was the most glorious ice cream I’ve ever had. I’d love to try the other flower ice creams, too. Happy travels! Oh it looks wonderful as well Patti – I never would have thought roses could give such a delicious flavour!! Butchart Gardens is one of the places I’ve always wanted to visit too!! It’s just gorgeous Rosemary. A very hot day when we were there too so that ice cream went down extra well!! I tried the lavender and loved that too!! 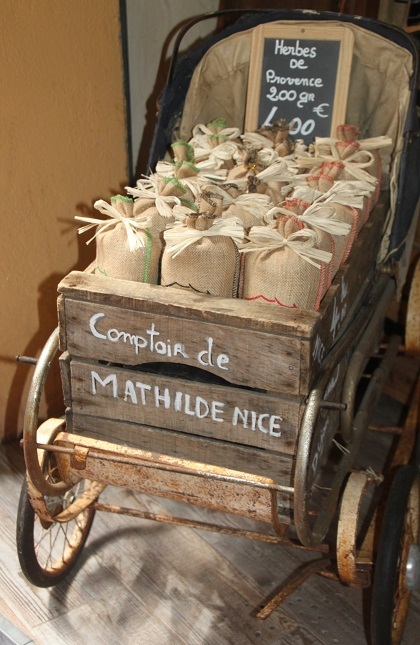 I went to Nice this summer, too! We stayed in the Old Town, it was excellent and very close to the beach! Hopefully you got to experience the Old Town at night as well. It is a very lively place to be! We only had a day there, we came by train from Cannes so left late afternoon (unfortunately). I can imagine the Old Town at night would be just gorgeous – maybe (hopefully) next time! Beer ice cream? I love beer but yuk! That seems to be the trend though these days – all the crazy flavors! Rose was as adventurous as I got – it was delicious. But those other crazy flavours, not for me!! Chocolate and strwberry for me, ülease. 🙂 Lovely impressions. Thanks Dina – yes those are the best flavours!! Oh – that sounds not so delicious either!! Who invents these flavours and does anyone like them?? It is refreshing and delicious – highly recommend! !